Pianist and composer Pablo Ziegler is a star of the New Tango movement and, since the death of Astor Piazzolla in 1992, its leading figure. Ziegler's father was a violinist in a tango group, but Pablo had a classical music upbringing. He studied piano at a conservatory from the age of four to thirteen, then began making appearances as a classical pianist. However, his father had taught him how to play tango piano, and Pablo occasionally worked with tango bands. In the early 1960s he became attracted to jazz, particularly be-bop and Dixieland. He counts among his major influences Charles Parker and Weather Report. In 1968 he formed his own group, the Pablo Ziegler Terceto. The trio became one of the most popular acts in Buenos Aires, particularly noted for jazz arrangements of classical music. In 1978 Piazzolla, the controversial innovator of a new style of tango, invited Ziegler to join his New Tango Quintet. Piazzolla said that all the pianists he had considered could only play straight classical tango. What Piazzolla needed was a pianist with classical training and skilled in jazz improvisation. When Ziegler accepted and announced that he was leaving the Pablo Ziegler Trio, his friends were dismayed and his fans were shocked. Piazzolla in those days was widely attacked for his innovations -- "To [many traditionalists] to change the tango is to change the national flag," observed Ziegler later -- Ziegler defended it to his friends as "tango for now and for the next century." The next decade or so was the period of growth to international fame and wide acceptance -- even in Buenos Aires -- for Piazzolla and the New Tango Quintet. The international music scene, including the realm of classical music, was intrigued by the transformation of tango into a concert music form. New Tango's often startling harmonic ideas, jazz elements and the spontaneity of improvisation led to appearances at major international music festivals, both jazz and classical. These included the jazz festivals in Montreal, Nice, Sapporo, Istanbul, and Montreux; the North Sea Jazz Festival and the Central Park Summer Stage. This activity slowed around 1988, when Piazzolla became ill. Looking back on that decade, Ziegler called it "New Tango University." He picked up Piazzolla's interest in innovation, as well as contributing compositions for the band. In 1992, when Piazzolla died, Ziegler founded his own Quintet for New Tango. One of Ziegler's innovations was dropping the violin -- long a part of the traditional tango sound -- and adding drums. At the start, the Quintet also lacked the bandoneón, the small accordion-like instrument. This, however, was less for the sake of innovation than the lack of a player he could work with after Piazzolla. He soon added Héctor Del Curto to play it in the band, which also includes Oscar Guinta, bass, Horacio López or Satoshi Takeishi on drums, and Quiqui Sinesi, guitar. On occasion, when Ziegler wants a more traditional sound, Antonio Agri appears with the Quintet as violinist. Ziegler and his quintet have toured often throughout the United States, including appearances at the Florida International Festival, Lincoln Center, the Santa Fe Chamber Music Festival, the Ravinia Festival and the Houston Society for Performing Arts. 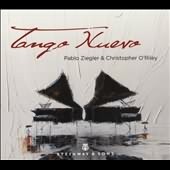 Ziegler has recorded his own two-piano arrangements of Piazzolla tangos on Sony Classical with Emanuel Ax, and his own and Piazzolla's music with the Orpheus Chamber Ensemble.